Now that “Strikeforce: Rockhold vs. Jardine” is officially yesterday’s news, it’s time for the UFC’s little brother to start filling out the fight card for their next major show. 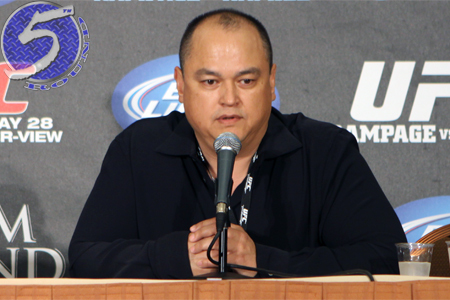 During Saturday’s post-fight press conference, Strikeforce CEO Scott Coker (Pictured) announced four bouts for their March 3rd event. As previously reported, women’s bantamweight champion Miesha Tate will defend her crown against Ronda Rousey inside the Nationwide Arena in Columbus, Ohio. Although the scrap is being met with much anticipation, Coker would not confirm the ladies would headline the festivities. They are still adding fights to the roster and are hopeful Daniel Cormier’s right hand will receive clearance to conclude the Strikeforce Heavyweight Grand Prix. Cormier meets Josh Barnett in the finals of the tournament. A lightweight shootout between K.J. Noons and Josh Thomson, a welterweight contest with Paul Daley and Kazuo Misaki and a female fight between Alexis Davis and Sarah Kaufman were also added to the lineup.